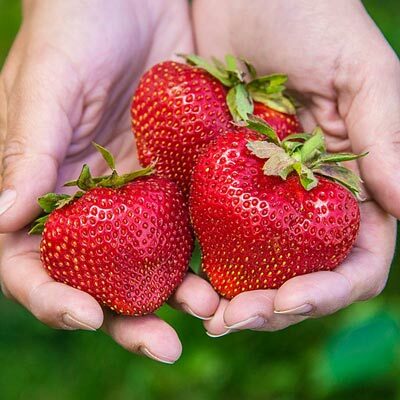 Impressive in size and beauty alone, Archer also has a delicious fragrance that adds to its taste experience—extraordinary flavor for a berry its size. Sure to be a hit at local markets—some of its large, red berries grow to the size of small peaches! Developed at Cornell University by Courtney Weber and bred to be cold hardy. Ripening early, berries maintain their large size through several harvests all season long. This strawberry is cold hardy, tough and productive with lots of disease resistance. Perfectly firm for fresh eating and freezing! Self-pollinating. Zone 4-8. For each offer ordered, get 10 Plants. Out Of Season Ships in Spring. Depth: Set crowns just below soil level. Soil Requirements: Moist well-drained, slightly acidic, sandy loam soil. Fruit: Very large, fragrant, red berries with intense flavor.